Vista Manager EX delivers state-of-the-art monitoring and management for Allied Telesis Autonomous Management FrameworkTM (AMF) networks. It automatically creates a complete topology map of switches, firewalls and wireless Access Points (APs), to enable effortless management of many, or all, network devices at once. An expanded view of the complete network also includes third-party devices such as security cameras. Intuitive usability puts comprehensive network information just a click away, easing the burden of administration. Real-time monitoring of network status and actionable reporting ensure the timely resolution of any problems. 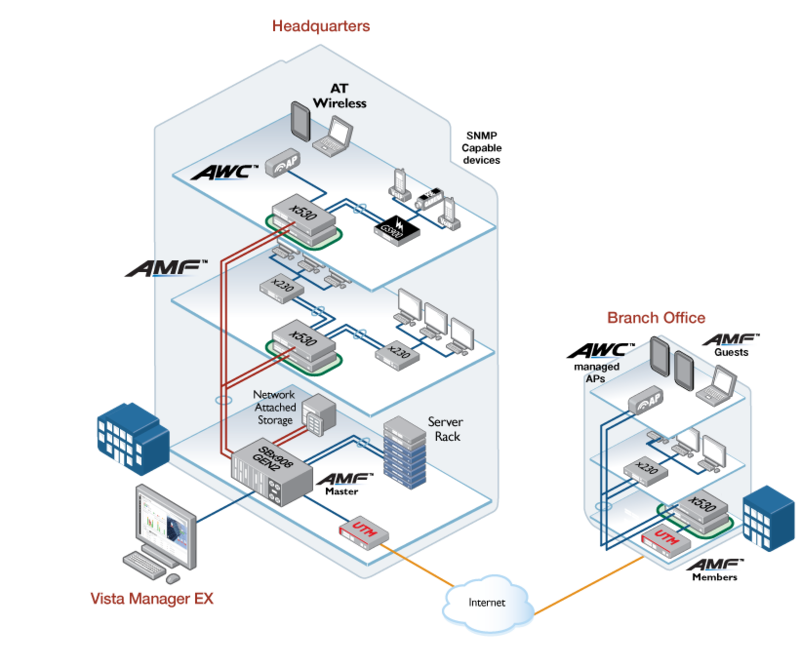 Vista Manager EX provides a single-pane-of-glass interface to the entire network. The dashboard includes network details and status, event information, and a topology map. Critical issues, such as internal security threats, link tampering, network loops, environmental alarms, and failed nodes, are highlighted on the network map and in the event log so they can be easily dealt with. Simple navigation provides the ability to easily manage and monitor any network device. 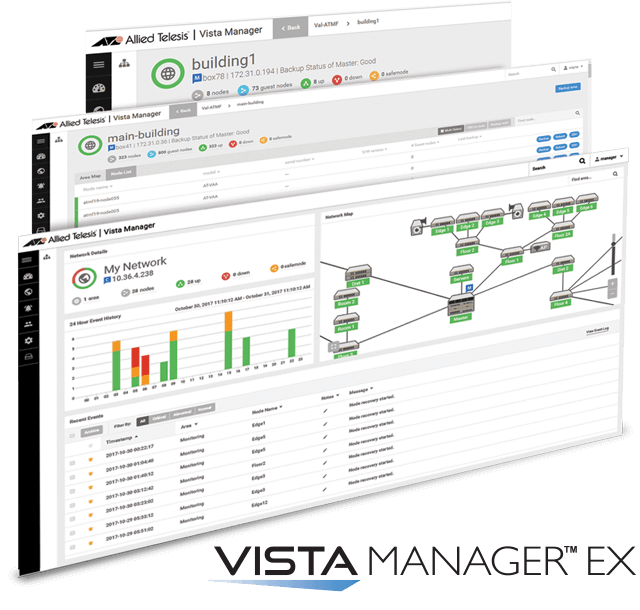 Vista Manager EX brilliantly combines a complete network overview with intuitive access to detailed information. The network map shows wired and wireless devices connected in the network. Using Tracepath enables a real-time connectivity check between any two nodes. 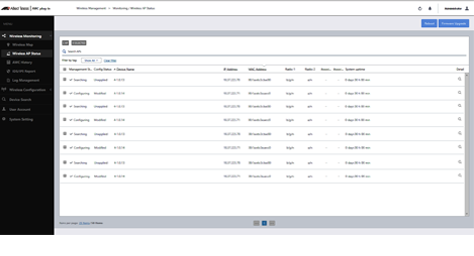 The service monitoring view allows configuration of visual monitoring of services running on a chosen device, with actionable reporting as events and alarms are displayed. The color-coded traffic map provides visual network utilization and bandwidth across all links, with constant updates, while the advanced view shows protocol use through the network, and from specific devices. Enjoy proactive network management using live and historical views to analyze traffic patterns and protocol use, and improve performance. 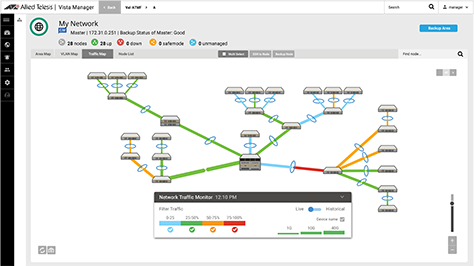 Simplify network management by creating and editing VLANs across multiple switches at once with a few mouse clicks. 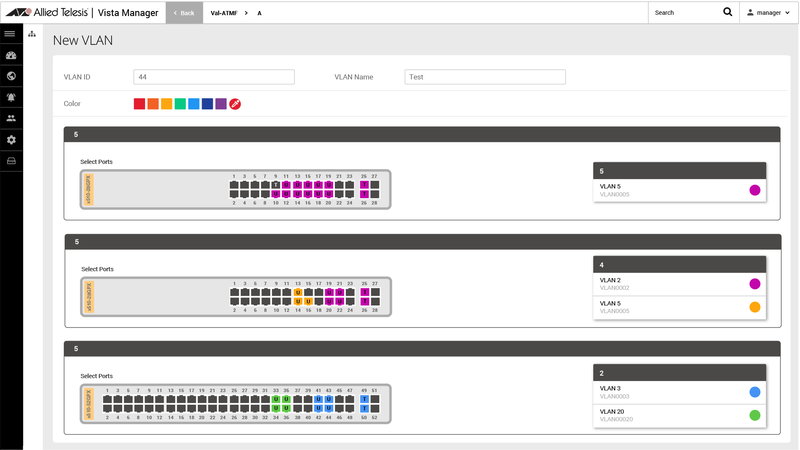 The color-coded VLAN map highlights network connectivity, showing data paths for your important business applications. Support multiple tenants with Vista Manager EX. Each tenant network is kept separate from others for secure deployment and management. Allow full administration or read-only access to as much or as little of the network as required. Multi-tenant support provides a high-value solution for large distributed companies, allowing for centralization or distribution of branch-office network management. Service providers can enjoy full flexibility when offering network provisioning and/or management services to individual companies. Network management is simple, with powerful features like automatic backup, upgrade and configuration of any group of network devices, or even all devices. Automated device recovery enables zero-touch replacement with new devices simply appearing in Vista Manager. The power of AMF and Vista Manager EX combines to ease the burden of administration, and support plug-and-play networking. Add management capability to Vista Manager EX with subscription based plug-ins. Optimize network management and reduce running costs by paying for current features, with the ability to upgrade at any time. The Autonomous Wave Controller (AWC) plug-in for Vista Manager EX features wireless management to control, monitor and automate operation of Allied Telesis wireless APs, with floor maps and wireless coverage heat maps. AWC incorporates wireless intelligence to model access point location and signal strength, and automatically optimize wireless output and channel selection for a superior user experience. Innovative Channel Blanket hybrid wireless enables multi-channel and single-channel operation at the same time, for a no compromise wireless network with high throughput and seamless roaming. 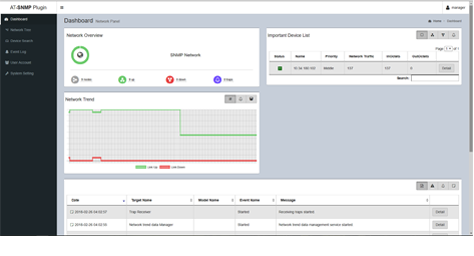 Auto-discover and manage a wide range of devices with the Simple Network Management Protocol (SNMP) plug-in for Vista Manager EX. Different network device views enable visibility the way you prefer. Extend network monitoring and enable pro-active management with automated notifications and alerts. With the ability to manage many or all devices at once, simplified VLAN management, and real-time traffic, protocol, and service monitoring, Vista Manager EX with AMF delivers real business value and low ongoing network administration costs. The color-coded traffic map provides real-time visual status of network utilization and bandwidth across all links. The advanced view shows protocol use through the network. Allied Telesis innovative Autonomous Wave Control (AWC) regularly analyzes wireless networks, and dynamically updates Access Points (APs) to deliver significant improvements in connectivity and performance, by automatically minimizing coverage gaps and reducing AP interference. AWC delivers a high-quality wireless experience that responds to network configuration changes and bandwidth demands from user devices. Simplify network management by creating VLANs across multiple switches with just a few mouse clicks. The Simple Network Management Protocol (SNMP) plug-in can acquire detailed information and statistics from a broad range of networking devices. Different views enable users to manage devices the way they prefer. It supports management of up to 2000 devices, and in large networks it automatically searches for SNMP agents and displays each device found in tree form, for an easy view of the overall network topology. The SNMP plug-in is a powerful addition to Vista Manager EX, adding management flexibility by supporting non-AMF devices. 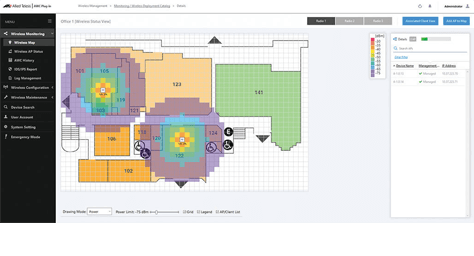 Visualize AP deployment with wireless floor maps. 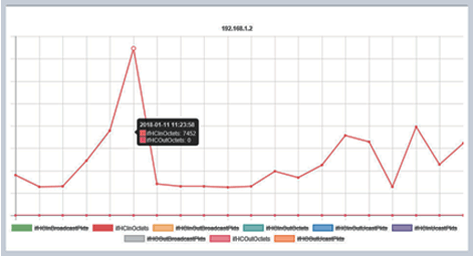 Graph statistical information obtained using SNMP such as interface traffic. Note: You can try Vista Manager EX for free by activating the 90 Day trial license after installation. The Trial license includes support for the AWC and SNMP plug-ins.